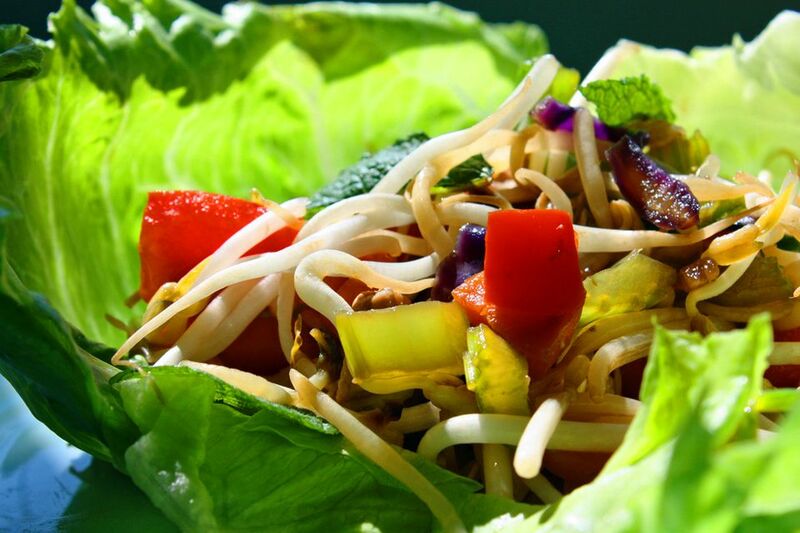 This Thai lettuce wraps recipe is quick and easy to make. Lettuce wraps are also a fun dish to eat as a party food, either as an appetizer or the main course. Serve the filling on a platter with whole lettuce leaves on the side, and let your friends and family wrap their own. They'll love the combination of crisp, cold lettuce with the warm, flavorful filling. It's a recipe treat that's low-calorie, low-fat and very nutritious to boot. Tip: Add a little water or white wine if your wok/pan gets too dry instead of more oil. Drizzle oil into a wok or large frying pan over medium-high heat. Add garlic, galangal (or ginger), chili, and shallots. Stir-fry one minute, or until fragrant. Add tofu (or shrimp/chicken/pork), carrot, shiitake mushrooms, cabbage, and spring onions. As you stir-fry, add the lime juice, soy sauce, fish sauce, oyster sauce (or vegetarian substitutes) and sprinkle over the sugar. Stir-fry about 1 minute. Push ingredients to the side of the wok or pan, and crack in the egg. Stir-fry quickly to break the yolk. Mix in with the other ingredients. Add the bean sprouts and stir-fry briefly to mix (avoid over-cooking or they will go limp). Remove from heat and do a taste-test for salt, adding more fish sauce if needed. Cut off the stem part of the iceberg lettuce so it's easier to separate the leaves. Now place the lettuce, stir-fried filling, and the toppings on your table in separate bowls/plates, allowing guests to make their own wraps.